We offer a range of specialised services for the discerning business and private traveller. We pride ourselves on the first class service we provide to all of our clients. It's time you were upgraded. Whatever you need, wherever you’re going, just sit back, relax, and leave it to the expert drivers in our luxury fleet – the professionals with the personal touch. From our base in Sheffield and Doncaster, MB Executive Chauffeurs provide a first class chauffeur driven executive car service to business and leisure clients throughout Yorkshire, Nottinghamshire, Lincolnshire and Derbyshire. We provide 24 hour services for travel, to any destination in the UK. Our chauffeur services are available for all journeys and occasions, including airport transfers, business and corporate travel, special events, tours, outings, London excursions, rail and port transfers. Our fully owned, executive fleet includes top of the range models from Mercedes-Benz and Jaguar. Our luxury vehicles are all fitted with stylish leather interiors, climate control and Wi-Fi internet, with complimentary bottled mineral water, newspapers, magazines and refreshening wipes for all our customers. We share a passion for luxury motoring and immaculate customer service for both our corporate and private clients, but don’t take our word for it – see our testimonials page for comments our clients have made about our Executive Chauffeur service. 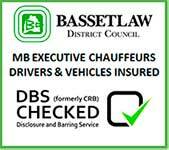 All our chauffeurs are fully licensed by the Bassetlaw District Council and have extensive knowledge of the local area. We comply fully with all legal requirements including reference checks and enhanced Disclosure and Barring Service (DBS) checks for all our employees. Health & Safety is also paramount at MB Executive Chauffeurs and drivers adhere strictly to our company policies and guidelines. Our suited drivers, with complete chauffeurs uniform including hat and gloves available on request. MB Executive chauffeurs are professional, polite, discrete, courteous and helpful and will assist you in every way possible including assistance with baggage, a meet and greet service, and all the usual courtesies associated with a prestige chauffeur service. A chauffeur service should be easy and affordable, whilst luxurious and with attention to detail. We continually strive to meet these objectives. Our top of the range Mercedes are the safest in their class. Our drivers are well spoken, experienced and truly care about your comfort and journey.